Defective Turrets, also called "Crap Turrets" by Wheatley, are damaged, ammo-less, unfinished, or faultily assembled Sentry Turrets. 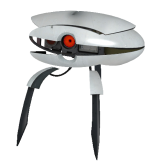 Unlike normal Sentry Turrets, Defective Turrets have a more humorous and sarcastic dialogue, and speak in a masculine, less robotic voice. They are harmless to Chell, many times making comments such as "If anyone asks, I killed you". Their voice lines seem to imply they are blind, but they are still aware of Chell's presence. They are first encountered in Chapter 5: The Escape. The Defective Turrets are voiced by Nolan North. They lack the outer white shell of normal turrets, and their insides are visible. Additionally, their laser guide is off or broken, and their dialogue indicates they are blind, though they seem to notice Chell regardless. They also seem to be out of bullets, as when they fire, only a clicking sound is made. After a while, they bizarrely catch on fire and explode. Some even appear to have been assembled sideways, or are still in their boxes. *In Chapter 5 of Portal 2, Chell sabotages the assembly lines by replacing the template turret with a defective one, causing all the fully functional turrets to be thrown out. This does not prevent fully-functional turrets from appearing later, so it's possible this problem was later rectified or did not affect the turrets which had already been built. *When GLaDOS attempts to surround Chell with turrets, she instead uses these because of the earlier sabotage. They simply stand around and click, then explode. *Wheatley later repeats this error when he plans a perfectly good ambush for Chell, but uses defective turrets instead of working ones, despite knowing of Chell's sabotage. They speak in a masculine voice rather than the feminine ones like the rest of the turrets. Their voices also seem to lack the robotic edge of the normal turrets. They sometimes will ask other turrets for bullets, try to speak in a higher voice to imitate non-defective ones, and humorously shout "Blam! Blam! Blam! I'm not defective!" in a vain attempt to not get tossed out. Certain defective turrets are in boxes. They do not shoot and blow up nearly instantly. These are not to be confused with the Oracle Turret, which is fully assembled but says different lines in the voice of a fully functional turret. If the player grabs one before moving the template turret and switches them instantaneously, the template turret exploding will cause the defective turret to become slightly misaligned. Despite this, the system still functions correctly. The turrets appearing in Course 5 of Cooperative Testing Initiative look like defective turrets but work and speak properly. This, possibly, means that defective turrets are built by broken 20th century machines, as Course 5 is set in the old Enrichment Center. Hacking a functioning turret into the game and placing it in the Master Turret Booth will cause it to change its model to a defective turret. This page was last modified on 18 August 2018, at 13:12.